One of the critiques that occurs when applying a religious or quasi-religious lens to modern secular cult like groups is the absence of supernatural agents. But, as I've said before, this problem usually comes from trying to generate one-to-one superficial maps onto questions that are best addressed via dynamical similarities. For instance if you focus on modern shirts, what happens when you run into a toga? The superficial features don't match. But the functional features do. From another perspective, the level of precision used in defining shirts was too great. 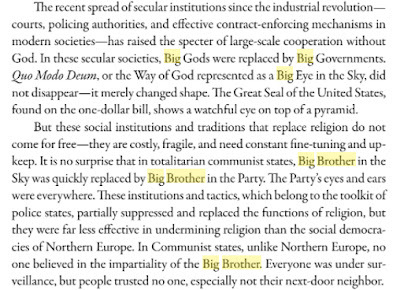 In his classic In Gods We Trust, Atran used the term Moral Big Brothers rather than Gods. 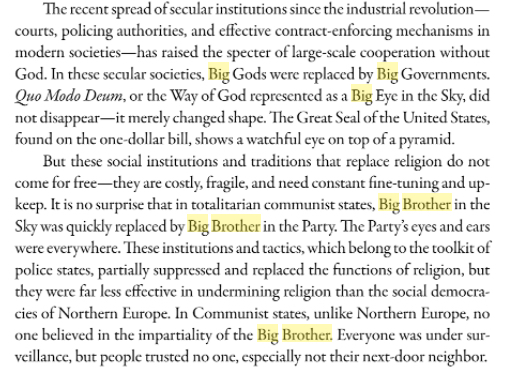 While religions often have supernatural Big Brothers, supernaturalism is a sub-set rather than supra-set. Norenzayan has expanded this idea more fully than Atran. They also add in the need for binary attitudes (but that is more to tie up details associated with a rigorous formal logical approach). On a whole, this boils down to something like the Turing test. The aggregator is rational if people ascribe intentionality to it. While their work has tonnes of depth and fascinating detail, I'll resist tangent-temptations and pull another quote. As mentioned the aggregation function is based in attitude biasing. More specially it is a type of espoused, and complexly aggregated, morality. Here are a few more quotes to take us to the end. List & Petti's work make no requirement for the degree of bias a Group Agent has on an individual. It just needs to have some effect. An inference from this, based on Atran's later work in Identity Fusion, and from the literature on moral groups, is that the degree of identification with a group's morality strongly influences the degree of bias a Group Agent (Moral Big Brother) has on the individual. For example, highly moral groups usually have more influential Group Agents (Moral Big Brothers) than weakly moral or a-moral groups. It is the dynamics that matter. In terms of modern secular quasi religions this means its the dynamics of the feedback from the Group Agent to the individual that matter. Groups that have significant Group Agent feedback combined with sacred values, ritual, costly commitment displays, and steep in-group out-group gradients are highly likely to be "religious".